Michael Noone has more than 20 years’ experience in emergency response, with international deployments to the Dominican Republic, Haiti following the catastrophic 2010 earthquake, the Philippines following Super-typhoon Haiyan, and multiple US deployments with the federal Disaster Medical Assistance Team (DMAT) CA-1. He currently works to coordinate public health disaster response for five counties in Southern California with a population of 15 million, and was previously the Emergency Coordinator with the Orange County Health Care Agency. "What makes this book unique is that the author endeavors to include everything an individual would need to know about international volunteering in one publication. As an ED nurse with dozens of deployments, this is the book I wish I could have read before I started my passion of working as an International Nurse volunteer! 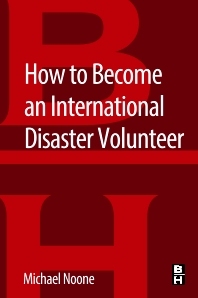 Everyone considering working as a disaster volunteer NEEDS this book!